Recorded as Gill, Gille and Gilles, this is a surname of several possible national origins and meanings. Firstly, it may be English and Scottish, and have originated as a nickname form of the personal name Giles, or perhaps more surprisingly, from William. The ultimate origin of Giles was the Greek word "aigidion", meaning kid or young goat, and as such it was a name brought into both England and Scotland by the Normans after the invasion of 1066 in the form of Gille. William, the favourite name of the Normans, has the elements of "wil", meaning desire, and "helm", a helmet or protector. Secondly the surname may derive from the Irish personal name "Gilla", cognate with the pre 7th century Old Norse word "gille", meaning a friend or servant. As such it has been claimed that this is the most likely source of the surname in northern English counties, with Ghille, Ghile, and Ghil appearing as names, there were no surnames at that date, in the Domesday Book of 1086 for Yorkshire whilst Gamel filius Gille, was noted in the Knights Templars register of Yorkshire in 1185. Thirdly when recorded in Ireland and Scotland, the surname can be a short form of the patronymics MacGille or MacGiolla, which translate as the "son of the follower". Finally the surname wherever found can be topographical from residence by a "gill". This was a ravine, deriving from the Old Norse word "gil", as in Michael del Gill of Cumberland in 1332. 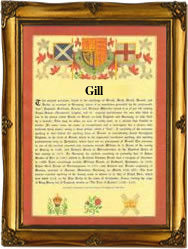 The first recorded spelling of the family name is shown to be that of Ralph Gille. This was dated 1202, in register of the Assize Court of Lincolnshire, during the reign of King John of England, 1199 - 1216. Throughout the centuries, surnames in every country have continued to "develop" often leading to astonishing variants of the original spelling.